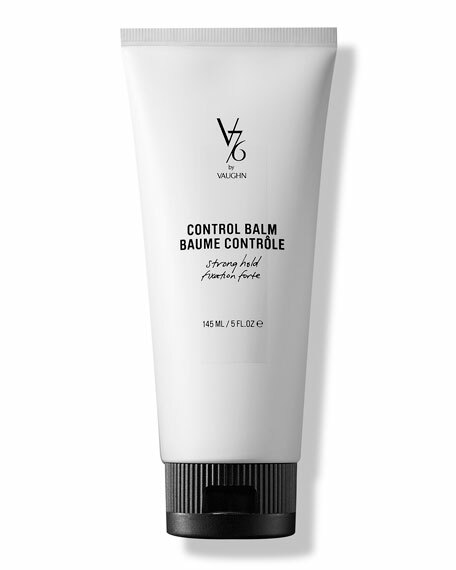 V76 by Vaughn Control Balm Strong Hold, 5 oz. V76 by VaughnControl Balm Strong Hold, 5 oz. This strong hold sculpting balm keeps hair where you want itperfectly styled and in place. HONEY acts as a humectant to prevent moisture loss and leaves hair shiny and lustrous. SOY PROTEIN moisturizes and improves hair elasticity and strength. SHEA BUTTER, rich in vitamins A and E, provides moisture to dry and damaged hair from the roots to the tips, leaving it healthy and shiny. ARGAN OIL nourishes and hydrates hair, helping to reduce frizz and flyaways. 145 mL / 5 fl. oz. The man who set the standard in men's grooming, Vaughn Acord, has brought his signature touch to a new line of men's hair and personal care products. A simple straightforward line, V76 by Vaughn features everything from energizing shampoos and conditioners, to weather-resistant control balms and lightweight grooming creams. You'll appreciate the quality natural ingredients and styling instructions that are a part of every product.